Soak cedar plank in water at least 30 minutes. Meanwhile, heat gas or charcoal grill. Remove plank from water. Place cheese (in rind) on plank. Spoon mango and raspberries over cheese. Sprinkle with salt. Place plank with cheese on grill over medium heat. Cover grill; cook 15 to 20 minutes or until cheese is warm. Remove plank from grill. Transfer cheese and fruits to serving plate. 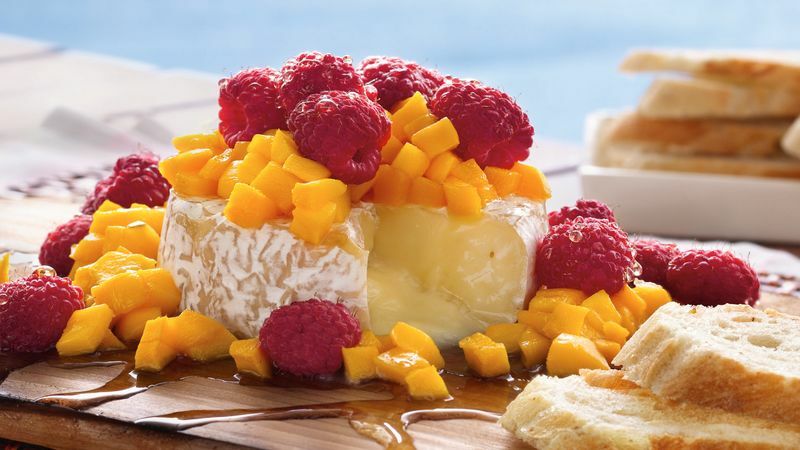 Drizzle honey over cheese and fruits. Serve with bread slices. Kosher salt is coarser grained than regular table salt. Look for it next to regular table salt, which by the way, can be used instead of the kosher type.